Physical medicine and rehabilitation employs diverse physical techniques such as thermal agents and electrotherapy, manual therapy, alone or in tandem to treat pain. Electrotherapy is the use of electrical energy as a medical treatment. It is primarily used for relaxation of muscle spasms, prevention and retardation of disuse atrophy, increase of local blood circulation, muscle rehabilitation and re-education electrical muscle stimulation, maintaining and increasing range of motion, management of chronic and intractable pain, post-traumatic acute pain, post-surgical acute pain, immediate post-surgical stimulation of muscles to prevent venous thrombosis, wound healing and drug delivery. 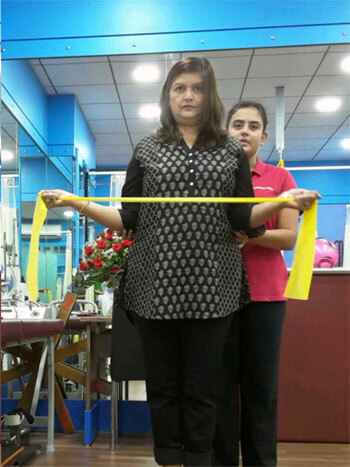 Manual Therapy is a specialized form of physical therapy delivered with the hands as opposed to a device or machine. In manual therapy, practitioners use their hands to put pressure on muscle tissue and manipulate joints in an attempt to decrease pain due to muscle spasm, muscle tension, and joint dysfunction. Depending on the assessment pain, the physiotherapist may perform some or a combination of the types of manual physical therapy: soft tissue releases such as trigger point release, myofascial release and joint + spinal mobilizations such as McKenzie’s, Mulligan’s or Maitland’s. Strength training is more useful and more efficient than most people realize, and a valuable component of fitness and most injury rehabilitation. Specifically it can partially replace so-called “cardio” workouts, which are highly repetitive and time-consuming and a cause of nearly all of the common repetitive strain injuries. Strength training can be done very safely and precisely, so that you can pursue fitness without aggravating existing injuries or risking new ones. Hand-held weights or homemade weights — such as plastic soft drink bottles filled with water or sand — may work just as well. Resistance bands are another inexpensive option. Your own body weight counts, too. Try pushups, abdominal crunches and leg squats. The core is a collection of muscles which stabilize and move the spine. Close to the spine and deep inside the abdomen is the inner core, which is comprised of muscles that engage first during movement or breathing to protect the spine. The outer core muscles are also responsible for stabilizing and protecting the spine, but they also have more defined movement functions. The core stabilizes and protects the spine by creating stiffness that limits excessive movement in any direction Strong core muscles make it easier to do many physical activities. They help protect your back and connect upper and lower body movements. A core exercise is any exercise that uses the trunk of your body without support, such as abdominal crunches. 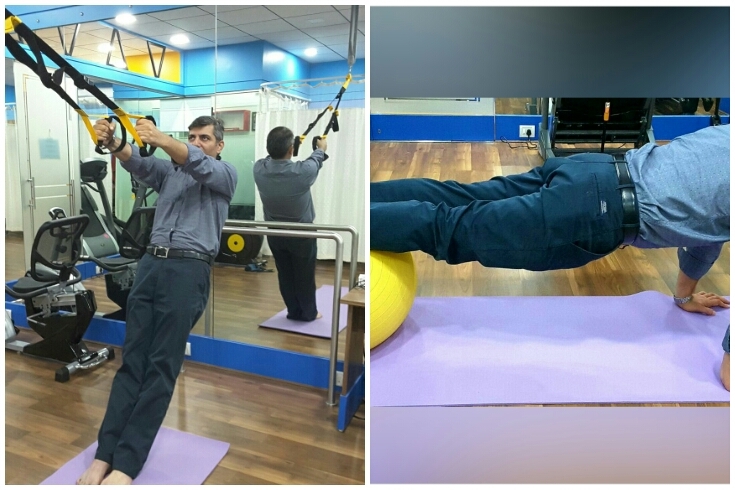 You can also try various core exercises with a fitness ball or trx. 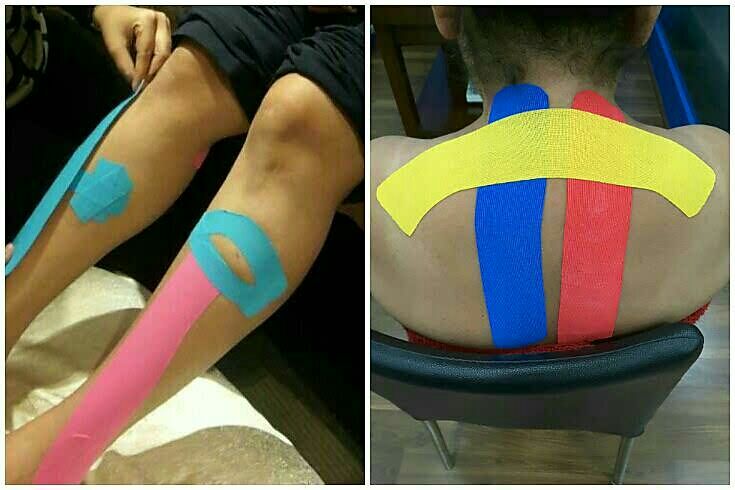 Rehabilitative taping technique is designed to facilitate the body’s natural healing process while providing support and stability to muscles and joints without restricting the body’s range of motion as well as providing extended soft tissue manipulation to prolong the benefits of manual therapy administered within the clinical setting. By targeting different receptors within the somatosensory system, the tapes alleviate pain and facilitate lymphatic drainage by microscopically lifting the skin. It also has the ability to re-educate the neuromuscular system, optimize performance, prevent injury and promote good circulation and healing. Dry needling is an invasive procedure in which a solid filament needle is inserted into the skin and muscle directly at a nerve / myofascial trigger point. A myofascial trigger point consists of multiple contraction knots, which are related to the production and maintenance of the pain cycle. Pain causes nerves to become “sensitized” in our extremities, spinal cord, and brain. If you have pain for an extended period of time, more nerves become “sensitized.” Dry needling works to deactivate these “sensitized” nerves. In addition, muscle spasms can be released by inserting a needle. It is believed to stimulate one’s own healing capabilities, which includes an anti-inflammatory effect. Dry needling can be used for a variety of musculoskeletal problems. The following conditions that can benefit from dry needling include, but are not limited to, neck, back, and shoulder pain, arm pain, migraine and cervicogenic headaches, buttock and leg pain, plantar fasciitis, and post-surgical pain. Cupping therapy is an ancient form alternative therapy which dates back to ancient Egyptian, Chinese and middle Eastern cultures. Cupping increases the blood flow to sore areas in muscles, providing important nutrients to the area that promote healing. It helps in removing stagnant blood and waste products, re-initiating the healing process to micro-trauma, stretches fascia and connective tissue, which leads to a relaxation response. It can also provide pain relief by exciting small nerves inside muscles so that they release pain-killing chemicals. During cupping therapy therapists apply glass, silicone cups to the skin for a few minutes to create suction. The application of cups can be used to treat a variety of conditions such as: muscle pain and tension, reduced joint movement, headaches, neck pain, back pain and sciatica, stress and anxiety. Fitness training is made up of four components: endurance training, flexibility and stretching, agility training and nutrition. Endurance training is also known as cardio or aerobic exercise. Aerobic exercise causes you to breathe faster and more deeply, which maximizes the c of oxygen in your blood. The better your aerobic fitness, the more efficiently your heart, lungs and blood vessels transport oxygen throughout your body — and the easier it is to complete routine physical tasks and rise to unexpected challenges, such as running to your car in the pouring rain. Flexibilityis an important part of physical fitness. Some types of physical activity, such as dancing, require more flexibility than others. Stretching exercises are effective in increasing flexibility, and thereby can allow people to more easily do activities that require greater flexibility. Stretching also improves the range of motion of your joints and promotes better posture. Regular stretching can even help relieve stress. For this reason, stretching and flexibility activities are an appropriate part of a physical activity program. Agility is the ability to change the direction of the body in an efficient and effective manner. It is influenced by body balance, coordination, the position of the center of gravity, as well as running speed and skill. Agility can be improved with agility training drills but also by improving the specific individual fitness elements of speed, balance, power and co-ordination. Agility is one of the main fitness components, important for success in many sports. Nutrition is needed for the body to function efficiently and effectively. The word diet often implies the use of specific intake of nutrition for health or weight-management. Complete nutrition requires ingestion and absorption of vitamins, minerals, and food energy in the form of carbohydrates, proteins, and fats. It is hugely influential on your efficiency to recover from any illness or injury. So many times our injured clients report that they have either put weight on when injured or have lowered the quality of their eating, often because of some change in their motivation.